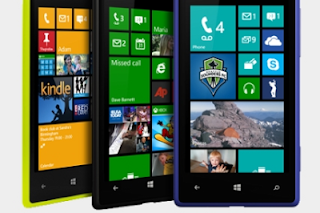 AdDuplex give the Windows Phone breakdown for April: The Lumia 920 is now the Windows Phone king! Windows Phone is always an interesting operating system to follow because it has one of the world's biggest companies behind it, it's widely considered to be a fantastic operating system and yet somehow Microsoft and Nokia in particular, just can't quite get it to catch on the way iOS and Android have! That being said there's been a bit of growth lately, but the guys over at AdDuplex have used their tracking software, which people put in apps, to give us a much more rounded idea of how well the platform is doing and which devices in particular are stealing the limelight! The one device which seems to be setting the ecosystem on fire is the Nokia Lumia 920. Nokia's flagship is now the most popular Windows Phone out on the market and it's finally knocked the Lumia 800 off the top spot for the first time! 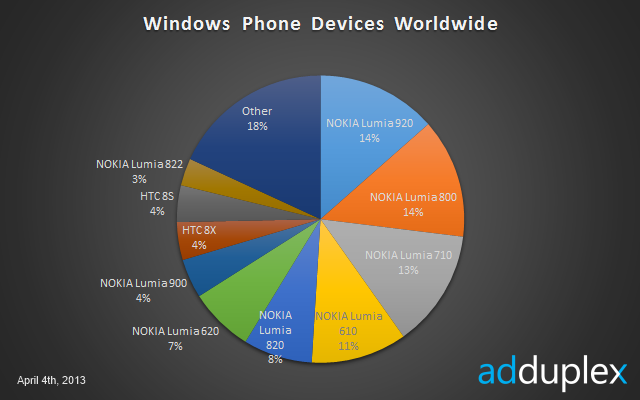 As you can see in the pie chart below, other phones are selling really well too, with the Windows Phone 8 powered range from the 620, through the 820 to the 920 all starting to catch up with their Windows Phone 7 counterparts which were released the year before! We're surprised to see just how few devices HTC have sold, given the amount of HTC 8S' which we've been seeing around lately, so perhaps we live in a particular hotspot for the device! The comparison between Windows Phone 7 and Windows Phone 8 sales is also interesting lately with Windows Phone 8 now starting to assert the sales authority on its older sibling in many of the key countries from Microsoft's perspective. 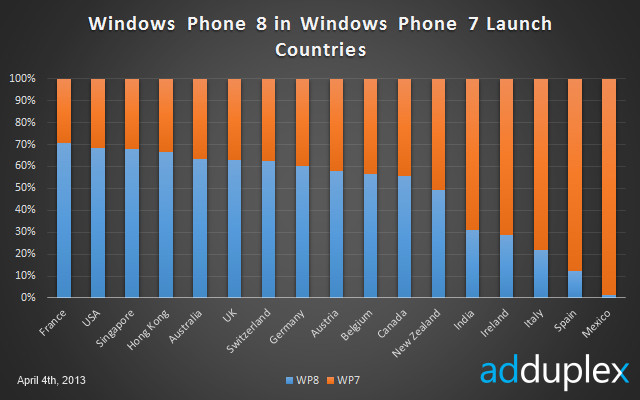 Through the majority of Western European countries and indeed in the US, Canada and Australia there are now more Windows Phone 8 handsets than Windows Phone 7 handsets in the wild! 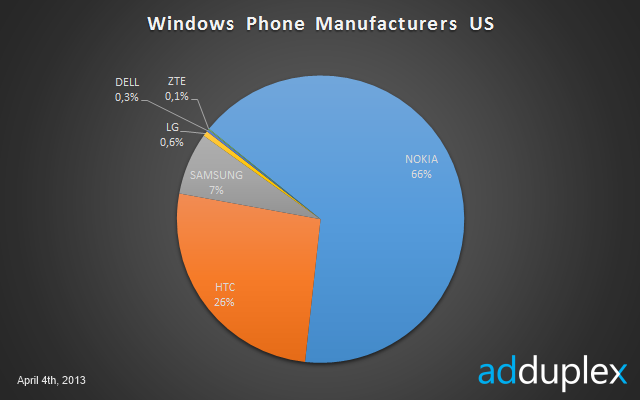 The final thing which we wanted to point out from AdDuplex's findings was that, in the key market of the United States, Nokia are the most popular Windows Phone manufacturer with 66% of the market. After the Finns it's interesting to see that Samsung's Omnia and ATIV ranges haven't proved very popular, especially not compared to HTC's devices. It'll be interesting to see whether or not Nokia can continue to grow in the United States, which is a market they've traditionally struggled in! If you want to read more about the platform then AdDuplex have lots more comparisons and country specific breakdowns on their website which you can find here!